The quality of Zuleta’s horses and the expertise of their local riding guides and cowboys is reflected in the yearly return of guests for whom a week of riding through the Andes above Hacienda Zuleta is an annual experience. But you don’t have to be an equestrian expert to experience the 4,000 acre historical working farm and surrounding countryside on horseback. With a herd of nearly 100 horses, the Hacienda is known for its beautiful Zuleteño horses - a unique mixture between the Spanish-Andalusian, Thoroughbred and American Quarter horse. The outcome of this crossbreeding is a robust and noble Andean horse with the perfect disposition for trail-riding. 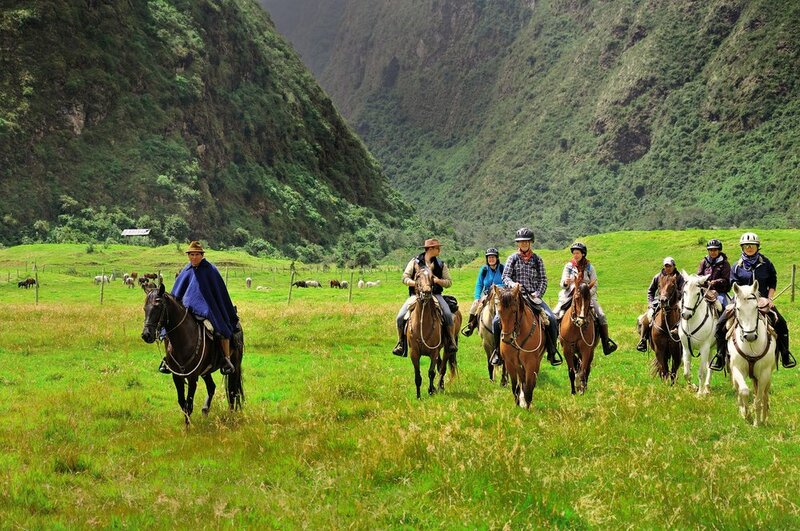 If a riding vacation is of interest, be sure to read through the detailed description of “Horseback Riding Excursions” Within you will find dozens of options ranging from short intro rides around the immediate property to half and full days rides which take more advanced riders to remote panorama points overlooking the snowy Andean mountains. Particularly fun for families (and accessible to children as young as 6) is the early morning “La Manada” in which participants assist the Hacienda cowboys in moving the herd from their overnight pasture to the hacienda, returning to Zuleta’s grounds among the thundering of hundreds of hooves! Horseback riding at Hacienda Zuleta is an additional cost, but their sales team is happy to create a custom package with flexible options for your guests. Longer stays are eligible for additional discounts and value - Book 3 nights and get 1 short ride free of cost. Stays of 4 - 5 nights receive a 5% discount. Stays of 6+ nights receive a 10% discount.